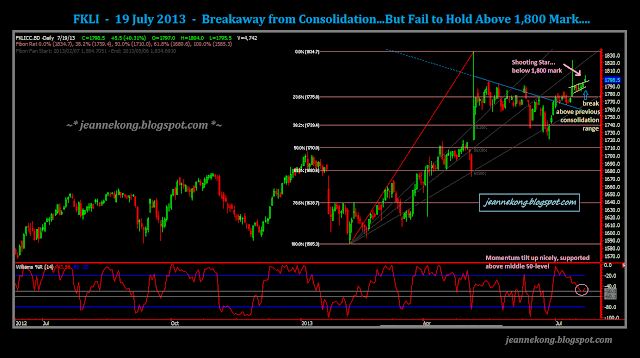 Price has been stuck within tight consolidation range after the July11 thrust. My last two posts have been largely on waiting for a breakout, with a bias towards the upside. Finally, the breakout came as July19 (Friday) open gap up to 1,797, went past 1,800 mark to hit an intraday high of 1,804, before closing lower at 1,798.5 in a not-so-pretty Shooting Star candle. 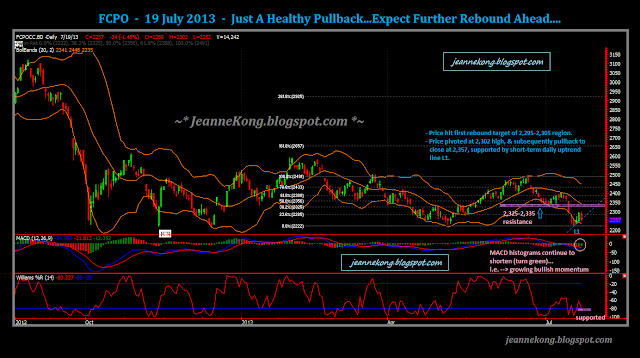 Price has reach my first target level at 1,800, for the rebound from July11 intraday low of 1,781.5. Expect slight pullback ahead as price fail to close above the 1,800 mark despite Friday's bullish opening gap up. 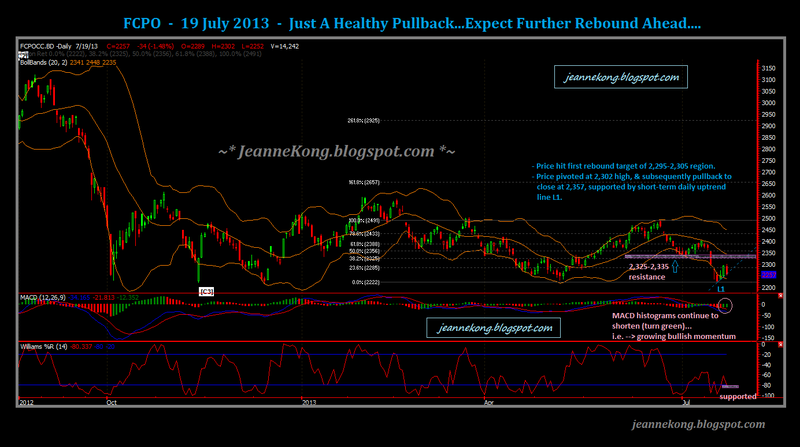 Nevertheless, subsequent supports aren't really far away, coming in at 1,796.5 | 1,791.5 | 1,784-87 levels. Obvious resistance overhead are the 1,800-1,810 level, followed by 1,820-25 (July11 high) & 1,835 (May06 high) levels above. Also, the momentum indicator W%R bounces right off its middle 50%-level, lending some support to the Bulls camp, while the candle pattern suggests the Bears has started to warm up their paws on Friday. Experience from previous wild-range candles suggests a high potential of seeing a 1-2month 'box consolidation' phenomenon, which is typical after each major thrusts we've gone through since April'13. In my July17 post, I mentioned CPO price show a small bullish candle akin to a bullish harami, & I was expecting further rebound to come. The very next day, July18 (Thu.) saw a Long Green formed, closing not far below 2,300 immediate resistance. On Friday (July19), price rises further, breaching through the 2,300 mark in early morning trade, hitting intraday high of 2,302. The morning gains was erased by a swift fall back below 2,295 support by lunch break on Friday. Later in the afternoon, profit taking & selling accelerated the fall & pushed price lower to close at 2,357 for the day/week. Despite Friday's lower close in the red, price still manage to stay above the short-term daily uptrend line ( plotted as L1 on the chart). L1 has been supporting the bounce from the week's low of 2,222 recorded on Tuesday, July16. Momentum wise, MACD histograms continue to shorten, indicating diminishing bearish momentum as price bounce from low of 2,222. Also, W%R continue to stay above its 80% line, suggesting more bears are taking a rest after working hard for more than a week. As long as L1 holds, I'll maintain my buy-on-dip approach, taking advantage of the counter-rally in the primary downtrend from latest major lower high of 2,400. That said, I'd like to see price reclaimed the 2,300 psychological level as soon as possible in the coming trading week, to erase the slight softening of bullish tone after Friday's fall. We shall see then, if price can continue higher to challenge the targeted 2,325-35 resistance band. - Watch for a technical breakdown of L1 uptrend line, or a turnaround in the momentum indicators. 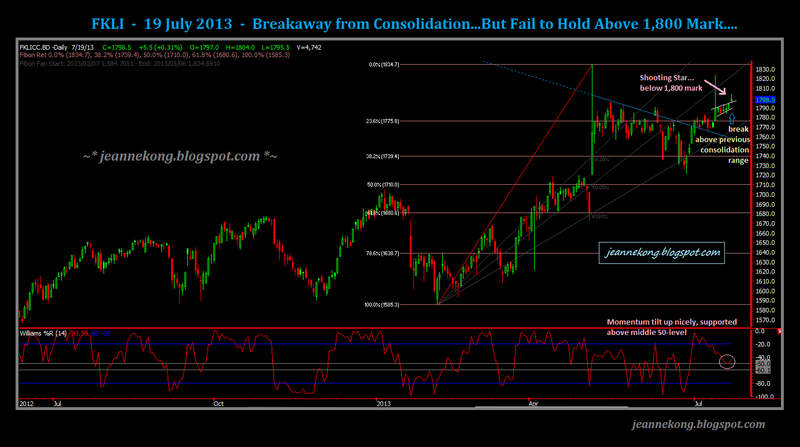 Primary downtrend has found its temporary bottom at 1,180-1,200 major support band back in late June trading. 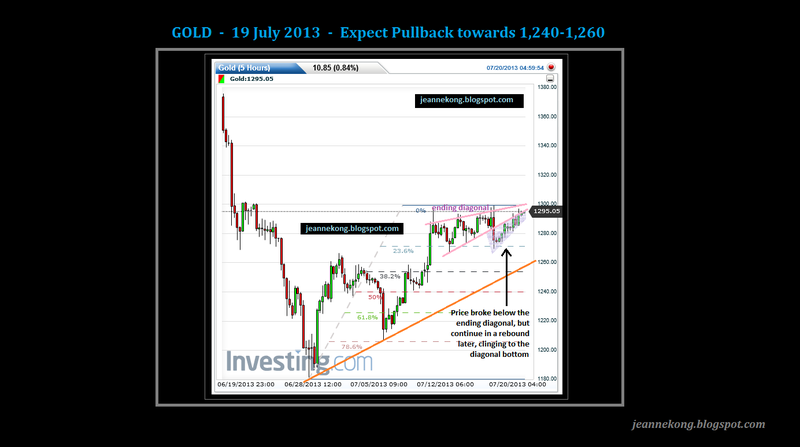 It has then formed a higher low at 1,207, after pivoting at 1,180 late last month, a basic criteria for an uptrend. My last post highlighted the ending diagonal forming on the 5H chart, hinting that the counter-rally may have temporary peaked at the strong psychological resistance level of 1,300. Price did broke below the ending diagonal, shortly after my post on Wednesday (July17) evening, as US traders started their trading day. Nonetheless, the fall halted at 1,270-75 minor support band, & subsequently climbed higher back to the 1,290-95 diagonal range. Despite the higher close for the trading week, bullish momentum had definitely weakened. While price late-week climb to close near week's high, it remains clinging below the diagonal pattern (plotted pink on chart). Such retest of trendline from below is a typical early warning of a potential pullback ahead, even better if coupled with a bearish divergence on any momentum indicators. Hence, I maintain my view on a short-term pullback for current rally from 1,180 pivot low, minor support comes in at 1,250-60 | 1,235-40 | 1,225. However, I still keep to my analysis that the counter-rally have yet to finish. I'm expecting it to continue climbing higher after this pullback, probably hitting my target of 1,330-40 | 1,370-80 | 1,400-1,420. We shall discuss the targets in more details after we break above the 1,300 mark decisively. For that to happen, we may need some really bad economic news/data out to give gold price a strong push-up. As for the charts, if they still don't show up clearly on the Blogspot image viewing interface, u may download the images & view them in your preferred photo-viewing applications for clearer viewing. Hope you all enjoy reading my post. Fxxk!! This guy copy my Blog content! !